Most of the pages regarding foot conditions on our site have to do with a specific problem or specific area of the foot. This page is written especially for those of you with generalized sore feet or achy feet – or just tired feet in general. Below you will find a detailed guide to eliminating the pain of just general tired and sore feet. Best of all, about 90% of you will be able to treat this at home. The most common cause of tired feet is the foot flattening out more than it should. This results in excessive stretching of all of the structures on the bottom of the foot. So, all day long, you’re tugging on these ligaments and tendons, and over the course of a day, they get inflamed and painful, so by the end of the day, your feet are feeling achy. When we treat tired, achy feet there are several things we do. Use stable shoes and arch supports as described below for 3 weeks. Don’t go barefoot at all during that time. If your still have sore feet, see a podiatrist near you. Number one, we teach our patients to wear the best possible shoes to support the feet. These are shoes that are stable This is true whether it’s an athletic shoe or a dress shoe. We regularly evaluate the best shoes on the market and you can go here to download our list of recommended shoes in all kinds of categories – for dress shoes, athletic shoes, basketball shoes, hiking boots and more. The second thing you want to do is make sure to do is to wear a supportive arch support. What the arch support will do is to stop the foot from flattening inside the shoe. You will need a support that conforms as close as possible to the arch of the foot. The links below are affiliate links and we will earn a small commission if you purchase through them. For the most support in full-size athletic and walking shoes use the FootChair Adjustable Arch Orthotic. This device is built with a higher than average arch for extra support but also has an adjustable arch via pads that can be inserted under the cover. 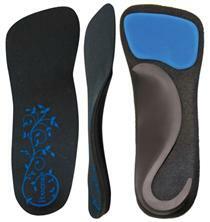 For athletic shoe and other shoes with laces this is the OTC orthotic we most commonly recommend to our patients. For dress shoes, including high heels, the Powerstep SlenderFit Fashion orthotic is the most effective OTC orthotic we have found. It has exceptional support of the arch but fits all but the very smallest dress shoes. It even adapts to different heel heights by flexing the heel. Our recommended flip-flops and sandals with arch support are from Vionic. Vionic Sandals and Vionic Slippers offer a rather amazing built-in orthotic arch support and can be found in a wide variety of styles. All Vionic sandals and slippers have a very supportive arch designed by a podiatrist. They are perfect for wearing at home, especially if you have hard wood or tile. If Your Feet Are Still Tired……. If you are still having tired feet, see a podiatrist who specializes in orthotic therapy as you may be a candidate for a custom orthotic to help treat your anhy and tired feet. Custom orthotics, if made correctly will conform almost air tight to the arch of the foot (this is called a “total contact orthotic”). This total contact orthotic will act to more effectively decrease tension on the structures on the bottom of the foot and decrease compression of the bones on top of the foot – thus more effectively getting rid of the forces that cause tired and achy feet. If you are in the Seattle area, contact us for an appointment. Finally, there are strengthening exercises that you can do to strengthen the foot so that those muscles support you better during the day. You can find instructions on how to strengthen the feet here. So, that’s it. If you’ve got tired feet, don’t live with it – it is not normal for feet to be tired or achy.